Can’t we make improvements on electronics recycling AND also make a dent in the problem of plastics? Earlier this week on November 15, 2010 President Obama signed a proclamation for AMERICA RECYCLES DAY 2010. While the proclamation contains nods to recycling in a general sense by referencing “participating in curbside recycling and community composting programs, and expanding their use of recyclable and recycled materials,” the focus is on recycling of electronics and reducing electronic waste. As an environmentalist I applaud the President’s call to address electronic waste, as many of the compounds in consumer and industrial devices contain numerous hazardous materials, and the recapture of those materials as we recycle will return valuable materials to the manufacturing stream, saving precious natural resources and energy along the way. 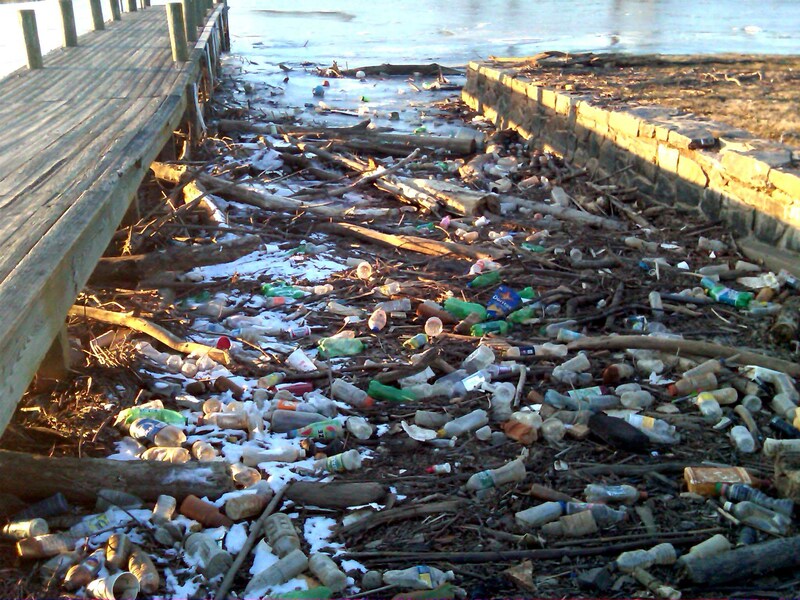 Improperly disposed of plastics pollute the Anacostia River in our nation's capital, Washington D.C. Recycling in the U.S. still has a long way to go. But I remain saddened to see that we continue to lack national standards for the recycling of consumer products, particularly consumer plastics. While I am in a general sense an environmentalist, I am in particular an advocate for the protection of our oceans and coasts, which means I am an advocate for the proper reuse of plastics as recyclables, as their improper disposal is having a large impact on our rivers, coasts and oceans. While I understand that in this political climate mandatory national recycling standards are not viable, the establishment and promotion of national standards as voluntary guidelines for recycling does seems plausible, or at a minimum, logical. Would industry push back against such voluntary recycling standards? Unlikely, as in several manufacturing sectors the problem is a lack of a volume of recycled materials. Do you live in a community that only accepts certain types of plastics, leaving you to look at the bottom of each container and determine whether to put into the trash or the recycling bin? Those items you are tossing in the trashcan because they don’t have the right recycling number on them aren’t actually unusable material – they too could be recycled – there just isn’t enough volume of these materials for plastic recyclers to build a viable processes to recapture and resell those plastics. There remains a lack of supply so no market has formed. People aren’t creating a supply because there isn’t a market in most locations. Government could step in and break this cycle. So how about it? A coordinated effort to call for a national set of standards which could be voluntarily adopted by counties and municipalities? We could end up with cleaner communities, less materials making their way to the ocean through careless handling and disposal of plastics, and we might just cut down on the consumption of raw product and energy in the process. Let’s not trade off headway in electronics recycling at the cost of much needed headway on the control and recycling of plastics. We’re a bright, industrious nation. We should be able to do both. And if you are feeling a bit skeptical about the validity of the possibility of having voluntary national standards, it’s noteworthy that just yesterday EPA released new Draft Voluntary Guidelines for Selecting Safe School Locations. So it’s clear that voluntary national standards are possible. The question that remains is will we do them for plastics recycling.